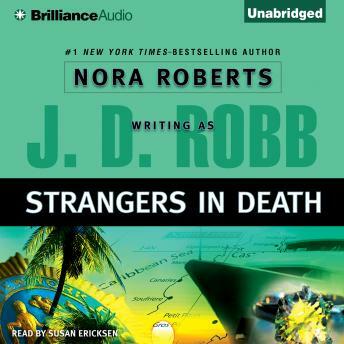 This is one of my favorite Jd Robb book , I love the references to Hitchcock strangers on a train . The Characters are competing the plot interesting . I love this narrator she makes the characters sound the way I imagined them to be . The app plays better than others I use the features are excellent. The entire in death series is an hour excellent read. Recommend to anyone who like a good murder mystery. GREAT!!!! This is a really great series of stories! I love them! You really should read them all. The reader is great! You can keep track of who is who. The story was interesting but I had to stop listening to the book as I could not listen to the narrator who had horrid voices for the characters. It was a really tough listen.. This was one of my favorites in the series so far. I liked hearing a little more of the personal relationship between Dallas and Roarke. The reader is superb. Very easy to keep track of the characters. Keep up the great work! This is great. Some of Robbs Death Series books have been to short but this one was just perfect. I always look forward to what Robb thinks the future will look like. She does a good job of building on the various friends of Dallas. The reader is absolutely great.